A council that wanted demonstrators marking the 75th anniversary of the Jarrow Crusade to cover the cost of road closures has backed down. South Tyneside council had demanded thousands of pounds from organisers of the anniversary march from Jarrow to London to cover the cost of closing local roads for a few hours in the historic north-east town that had played a key role in the early labour struggle. Youth Fight for Jobs was presented with a bill for £2,230.20 plus VAT but had refused to pay – even if it meant going to court. Organisers condemned the charge as an "affront to democracy" and an attack on the right to protest and said their victory set a precedent for other groups facing similar charges. 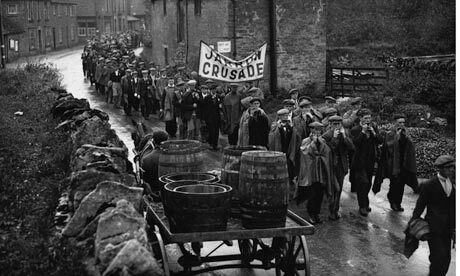 The march – planned for 1 October – will follow the route of the first jobs "crusade" when 200 shipworkers marched over 300 miles to London to protest against poverty and unemployment. Five hundred protesters plan to demonstrate in Jarrow with 50 youths then setting off on the trek to London via Leeds, Nottingham, Coventry and Northampton. They are due to arrive in Trafalgar Square on 5 November. The walkers plan to sleep in church halls and live off food rations and good will, organisers say. Paul Callanan, national organiser for Youth Fight for Jobs, said that no other council whose areas the demonstrators pass through, including Westminster, had asked for payment. He had never heard of such a charge being levied against demonstrators, he said. "South Tyneside council were completely wrong and their change in stance is an acknowledgement and a victory for anyone wanting to exercise their right to protest," he said. The RMT union had written to every Labour councillor in the area to "put pressure on the bureaucrats to get this about-turn". "Hopefully this sets a precedent when protesters come up against these sorts of charges in the future." The Labour-run council, which spent over £75,000 taking Twitter to courtin California to force the site to hand over information to identify a blogger, had previously said that the levy was a standard charge applied to all events except Remembrance Sunday and Good Friday, and had been its policy for several years because of budget constraints. But the council dropped the charge saying that the cost of road closures will instead be met by the council-funded Community Area Forum for Jarrow and Boldon which has its own discretionary budget. A spokesman said: "Like any major event, public safety is the most important consideration and as the organisers were unwilling to pay the necessary fee the Community Area Forum has stepped in to meet the cost of the closure, subject to the organisers providing the necessary event information".